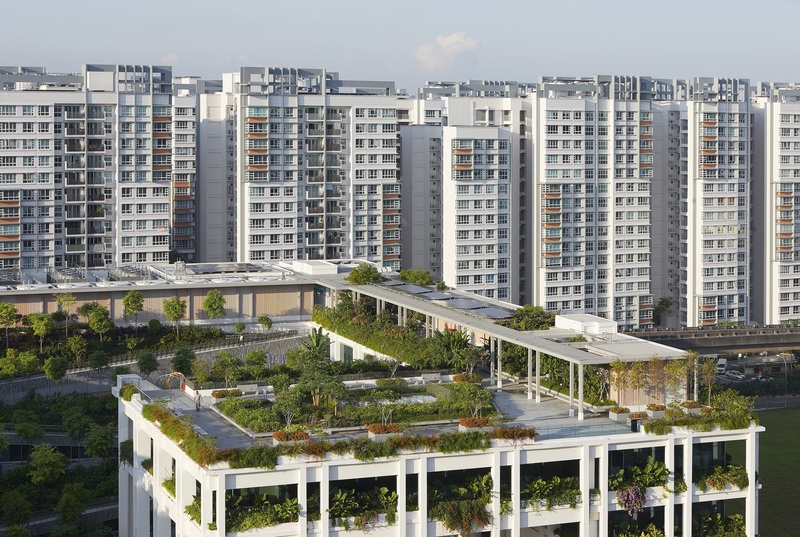 A front view of the Oasis Terraces in Punggol, Singapore. An interior shot of Oasis Terraces. Some of gardens which adorn the centre. The first in a new generation of community centres has been progressively opening its doors in Punggol, Singapore. Developed through Singapore's Housing and Development Board, in collaboration with the Ministry of Health, Oasis Terraces comprises of communal facilities, shopping, amenities and a government polyclinic. So far this month, a paediatric clinic, women's clinic, and multiple restaurants have all become available at the centre, which was completed midway through 2018. London architecture firm Serie was responsible for the design of the 27,000-square-metre site, winning World Architecture Festival's Future Projects Award in 2015 for its work. Serie Architects Principal Christopher Lee said they ensured the building embodied a sense of community. "Our design isinformed by the open frames commonly found in the facades and corridors of HDB's housing blocks ofthe 70s and 80s," he said. "We've transformed this precedent into a light and open frame that captures and accommodates diverse programmes for the community in a landscape setting —it is an architectural framework for communal life to unfold." An aerial shot of the Oasis Terraces. Serie Architects' design utilises a series of garden terracesthat slope towards the waterway as one of the key elements to generate communal activities. The gardens act as communal spaces, children’s playgrounds and a natural amphitheatre. The roof features planting beds for urban farming, which residents are encouraged to contribute to and maintain. Overlooking the communal gardens are rooms and outdoor areas for communal dining, restaurants, education centres, and polyclinic services. Situated on platforms, these spaces are directly connected to the terraced garden, allowing dining activities to spill out into these areas. A large sheltered plaza fronting the waterways creates the "vibrant heart for the community". Sitting at the crossing pointof the east-west and north-south thoroughfaresof the site, the plaza is set be used for a wide range ofcommunal activities.